Many of us have dreamt of owning a racehorse, yet we don’t realise just how achievable that dream can be! Use this guide to help you uncover the exciting world of racehorse ownership and start living your dream. Sole ownership: Owning a horse outright gives you the chance to receive 100% of the owners prizemoney, name the horse and race it in your colours. You will also pay for 100% of expenses but have the benefit and flexibility of decision making and direct communication from the stable. Partnership: When you race the horse with up to twenty family members, friends or stable clients and share the thrill of ownership for a percentage of the cost and prize money. You will appoint one owner as a manager to handle communications with the trainer . Syndicate: Registering a syndicate with your friends and family (up to 20 people), and the Syndicate then owns a share in the horse. For example you and your workmates might form a syndicate called ‘Men at Work Syndicate’ which has a 10% share in a horse. The nominated Syndicate Manager would be responsible for all communication to the syndicate members from the racing manager or stable directly, and in charge of the distribution of the syndicate’s share in prize money. Lease: Leasing a horse can be a cheaper option to experience horse racing. You can lease a horse with your friends and family without purchasing or owning the horse. The Lessee pays for all of the training fees and associated costs, keeps a percentage of any prizemoney won, and returns a percentage back to the owner (typically 20-30%). There are many benefits of owning your own racehorse, from naming your horse, to choosing jockey silks, not to mention the thrill and prospect of winning. 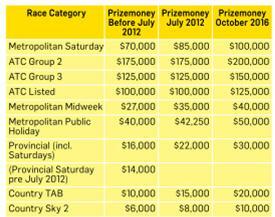 The biggest benefit of direct racehorse ownership is obviously prize money, bonuses and trophies earned by your horse. Did you know that one Saturday win in the Metropolitan area could cover training costs for a year or more? The jockey wears the colours provided by the managing owner, syndicate or the trainer. Get creative and design your own set of unique colours that could one day be the start of a dynasty! Register your colours with Racing NSW to ensure they are available. A huge highlight of ownership is naming your young racehorse. Coming up with a clever and unique name can be quite a challenge but is a lot of fun. Remember that your horses name will be shouted by a race caller and if you’re really lucky, may be chanted by the crowds like a true champion. Would you have thought of Eleecopter for a Spinning World out of Eleebana? Or Chess for Strategic x Slow Motion? When you become a racehorse owner, you are opening the doors to racing’s elite. Imagine rubbing shoulders in the mounting enclosure with Gai Waterhouse, or walking alongside champion jockeys like Hugh Bowman. Having your horse race, gives you that backstage access to racing royalty, and hopefully may propel you into the spotlight if your horse wins! After all the careful work in choosing the horse, and the patient time and preparation it takes to train the horse, you will no doubt want to be trackside to watch your investment launch around the track. As an owner you are privileged with tickets to the racecourse when your horse is running, including tickets to the Member’s Enclosure and Winning Enclosure. This access will ensure you are standing with your trainer as the last words of advice are given to the jockey, moments before he or she is whisked up on your horse. You can then watch the race in the members stand for a great view, or stand by the rails in the enclosure, as close to the action as you can get. If you are lucky enough to win the race, you will get your picture taken with the horse, receive the trophy in a presentation (if applicable for bigger races) and then you and the horse’s connections are invited to the Winning Owners room to celebrate in style. Becoming a racehorse owner requires a sound judgement of investment. 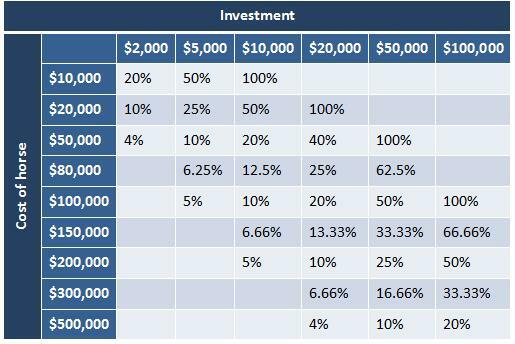 Your level of investment will affect what percentage share you can afford to purchase, and the location of where your horse will be trained. 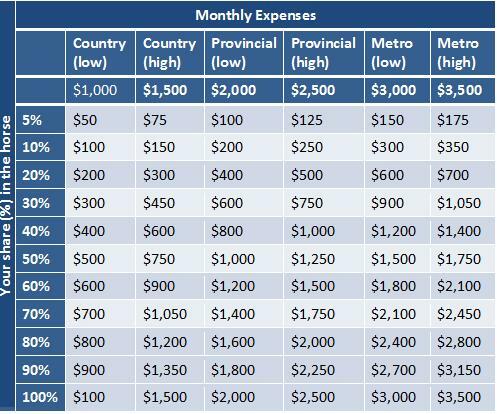 How much do you want to spend on monthly outgoings? is completed and returned to Racing NSW. New South Wales is the birthplace of thoroughbred racing in Australia. Since the first race in Hyde Park over 200 years ago, the NSW Thoroughbred Racing Industry has continued to thrive. NSW is the home of the world’s richest race for 2YOs – the Golden Slipper, the largest breeding ground in the Southern Hemisphere in the Hunter Valley, and employs more than 50,000 people. Why would you race anywhere else! The Breeder Owner Bonus Scheme (BOBS) is a NSW incentive scheme designed to reward owners for racing horses in NSW by providing ADDITIONAL prize money to owners. In the 2014/15 season, over $12 million of BOBS bonuses were awarded. Progeny of BOBS stallions standing in NSW are eligible for the scheme, and are paid up by their owner. BOBS horses are then able to win BOBS bonuses in all races in NSW with the exception of Group and Listed races. BOBS Extra is an initiative started in 2010 which supports owners who have greater expenses when they race older staying types of four years and over. The aim of BOBS Extra is to improve the quality of middle distance and staying races in NSW, to preserve the racing careers of thoroughbreds and to reward the patience of owners and breeders with slower maturing horses. BOBS Double-Up is an innovative incentive to reward owners and encourage participants to reinvest BOBS earnings back into the racing industry. With BOBS Double-Up, owners can elect to take DOUBLE their earnings in the form of a voucher which can be used towards the purchase of an unraced BOBS eligible yearling. Racing NSW publishes a monthly magazine which is a hub of information for industry participants as well as enthusiasts. Each edition is full of stories from the tracks around NSW, as well as listing practical information such as every licensed trainer and jockey in NSW with their contact details. If you are serious about becoming a racehorse owner, then you should think about what your horse will do after its career on the racetrack comes to an end. Breeding: The very best male racehorses can retire to become stallions and hopefully pass on their best characteristics. Many female horses will retire to stud at the conclusion of their racing career. Retraining : Not all horses are destined for a career in breeding (including geldings that cannot breed) and therefore they can pursue an active career in equestrian activities such as competition, pleasure horses and security and mounted police. The long term vision of the TRT is to support the Racing NSW and Corrective Services NSW Thoroughbred Rehabilitation Program and to make the Thoroughbred Rehabilitation Program self-funding via industry funding sponsorship and donations from the broader community, so as to able to care for every Thoroughbred retired from the NSW racing system. If you think racehorse ownership is right for you or maybe you want to know a bit more before you make a decision, refer to 'The Next Steps'. This guide will give you some important steps before purchasing you racehorse, such as including a sound investment plan, picking the right team, and selecting the right type of horse for you.